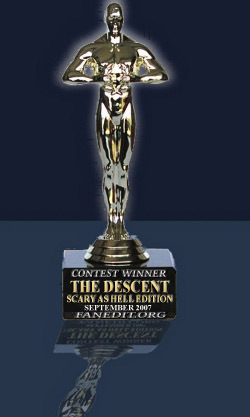 This is the scary as hell take on THE DESCENT. Less psycho, less moral, less dragging, full crawler attack. Remove the dragging beginning, take out the hallucinations, take out Juno being attacked by Sarah, let the movie play in reality, have one ending only, create a movie I prefer to watch again. This is my second fanedit. My first fanedit is THE HILLS HAVE EYES 2 – SCARY AS HELL EDITION and has been downloaded more than a 1000 times. I again released it as avi first. There is also a DVD version for this. And an ipod version will be attached to the DVD. Sarah is a the traumatized psycho of the group. In a terrible car accident her kid and husband get killed, while she was driving. When the other girls take her on the caving tour she is still not cured. During the movie she has lots of hallucinations and in the grand finale she is living in her hallucination, celebrating the birthday of her daughter. All of this is gone. She is traumatized, yes, but we don’t see why and we never experience any of her hallucinations. Removing these scenes made Sarah more a member of the group and less the focus of it all. Also it spares the audience from the rather dragging and long beginning and it makes the single ending more possible. Removing the hallucinations keeps the entire movie in reality. Juno is the heroine of the group, the fighter, the leader with great physical skills and a bit of a lack in social skills. She is responsible for the group getting lost in the cave and she also by accident kills one of the girls. For this she has to pay a great price. Sarah hits her with a climbing hammer, so she cannot run away from the crawlers and is destined to die. This killing by revenge was for me the reason for this fanedit. It was an accident. Juno is a good guy and she saved more lives than each of the other girls. Killing her like that was totally unnecessary and it felt unfair to me. Yes, she walks away from the dying Beth, although Beth asks her to stay, but still, she is in panic and it is all too much. Her reaction is maybe not nice, but very understandable. Since I don’t want to spoil it all, I will just say: I changed a lot, so Juno can be a hero in the end. Yes, it simply is. The second ending felt completely senseless to me and rather confused me than making me think: “oh brilliant.” Now I think I do get the intention of the director, but it did not work for me, so I changed it to one single ending. I didn’t touch the monsters, although my first intention was to reduce their scenes. But with the entire movie in reality, they are just scary, disgusting and cool, even in the scene, when one crawler sits on Sarah and doesn’t realize that she is alive. The monsters appear late, but they do quite intense then. So finally you get a horror movie, which was improved in my opinion. The original is great, but this one is for sure scarier. I kind of enjoyed the faster pace of this fanedit but it really didn’t do it for me. 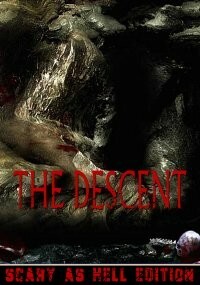 The original movie is about Sarah’s “descent” and Juno’s betrayal. Juno was having an affair with Sarah’s husband, Paul. Paul was distracted while driving, probably thinking about Juno (since they had just given each other “the looks”), which resulted in the tragic car accident ie. the death of Sarah’s husband, her daughter’s death, and her emotional/psycho problems. That’s why Sarah killed Juno. There were clues to the affair early on, such as how they looked at each other at the beginning. But the give away is Juno’s pendant/bracelet which reads, “Love Each Day”, which was given to her by Paul and is a phrase that Paul would say often, as we are told by Sarah early on. When Sarah finds Beth, Beth gives her the bracelet and tells her where it came from. This is why Sarah shows Juno the bracelet before Sarah seals Juno’s fate. Juno knows that she has been found out to be the betrayer that she is and knows that Sarah, with madness in her eyes, is going to kill her. By removing this subplot, the ending is quite anti-climatic when compared to the orginal US and UK versions. I can easily accept the removal of Sarah’s hallucinations, as the pace is immensly improved and the film is more action oriented as a result. But trying to make Juno into the “good guy” just doesn’t work, as she is very much the “bad guy”, ultimate betrayer, in the original and in this version is still responsible for their predicament in this version and still abandons Beth. Of course, on first viewing, Juno’s death is a shock but on second viewing, after realizing her betrayal, I enjoyed seeing her get what she deserved. This edit reminds me of how I feel about Azazel. I loved the original Fallen and found Azazel less to my liking, but still gave Azazel a 10 because it accomplished what Boon wanted to accomplish by turning a psychological thriller into a straight up thriller. This edit doesn’t fully accomplish what it wanted to, I enjoy the UK version the most, but is still enjoyable with its quick pace. So I’m giving this a 9.
flyboy707: you speak the truth. I have shown this to many of my friends and they all loved it. If you even remotely liked the original version or horror movies in general, then DL this movie! Technically, an excellent edit as well. I couldn’t see anything negative to comment about. I 100% agree to my predecessor. NOW it’s a great horror movie.